This California wonder has the world's grandest sequoia groves. One tree - the General Sherman - measures 83 meters (275 feet) high and 31 meters (103 feet) in circumference, making it the earth's largest living tree in terms of volume. 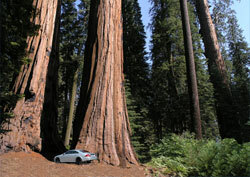 If you visit only one grove in Sequoia National Park, make it Giant Forest. The General Sherman tree lives here, as do many other massive specimens. The Giant Forest has a one-hour paved trail for exploring the towering trees. Some are 2,000 years old. Drive through a tunnel carved through a giant tree that fell across a road. The famous 19th century conservationist John Muir called Crescent Meadow the "Gem of the Sierra". It's still unspoiled. Climb 400 steep steps up this domed rock for a breathtaking view of the surrounding landscape. A 19th century settler built his cabin inside a fire-hollowed fallen sequoia. Tour a cavern composed of marble, complete with stalagmites and stalactites.